"You have my deepest sympathy on the loss of your love one,..."
"If the Army and the Navy ever looked on Heaven's Scenes,..."
Eileen F. McGoffin passed away peacefully at home on Mon., Aug. 29, 2016 in Amboy, WA. 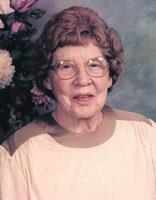 She was born on Feb. 13, 1920 in Oswego, OR. Eileen was best known for being an excellent listener and caring very deeply about people. She was always optimistic and had a great sense of humor. Eileen brought light and hope as she encouraged people through all their life situations. People valued her wisdom and her sensitivity to their feelings. Eileen's faith was put into action in her relationships. Independence, hard work, thriftiness, and perseverance were also core values. Eileen was a high school graduate who had advanced education in radio engineering, broadcasting, and radio repair. She served in the women's section of the Marine Corp. from March 3, 1944 to Dec. 14, 1945, during World War II, doing repair on aircraft radios and clerical duties. In addition to being the first woman disc jockey/broadcaster in the Pacific NW, Eileen also held a variety of clerical jobs, and retired at age 65 from the position of financial worker for DSHS after 12 years. Her retirement years were spent on the beloved family farm, to which she had first returned in 1955 to raise children after being widowed. She was away from the farm from 1963 to 1972, but was the first of the family to again return. Writing short stories and articles for publication in magazines became Eileen's serious hobby after her retirement. She helped form the Cedar Creek Writer's group, and was recognized as one of their most published members, inspiring the others. Eileen was a member of Cherry Grove Friends Church, she had a 55 year certificate from the Grange, and a fifty year letter from the American Legion (where she was the first woman to integrate her local chapter). She was preceded in death by her parents, Orce and Florence Jones; her brothers, Alvin Jones and Curtis Jones; and three husbands, Norman Johansen, William McGoffin and Harry Hanlon. Eileen is survived by her children, Kenneth McGoffin and Sharon Sharp; grandchildren, Barton Sharp and Lorica Stock; and great-grandson, Jaden Stock. The memorial service will be at Layne's Funeral Home on Sat., Sept. 10th at 11:00 a.m. In lieu of flowers, donations may be made to Boys Town, PO Box 6000, Boys Town, NE. This was one of Eileen's favorite charities, which she enthusiastically supported for many decades.